No discusson regarding Buffalo’s film industry, is complete unless Korey Green is mentioned. For those who may not know Green, he made his directorial debut in 2006 by co-directing The Forgotten City—a documentary exploring race, segregation, crime, and politics in Buffalo. Since then, Green has made incredible strides. He recently premiered his feature film entitled The Romans for the Buffalo Dreams Fantastic Film Festival in November 2014. This 95-minute urban drama is a modern day version of the life of Julius Caesar set in the inner city of Buffalo; a film with an unexpected executive producer: Buffalo school board member and former Buffalo Sabres managing partner Larry Quinn. I could only wonder how this successful businessman and aspiring filmmaker came together to make this film. Green recently sat down with The Public to discuss the culture of Buffalo’s film industry and the dynamic of relationship building. What was the process in collaborating with Larry Quinn to get your film completed? Well, Larry is a tremendous friend, and more like family to me. We originally met through his son, Matthew Quinn, who assisted me in a documentary that I was doing for Artvoice in Ghana, West Africa. Before Larry and I became friends, we had a deep mutual respect for one another’s work. Before my idea for The Romans surfaced, we talked about several film ideas over the course of some years. However, once I presented my idea for The Romans he didn’t say, “That’s good” or “Keep up the hard work.” He said, “Let’s talk more.” Eventually, our normal private conversations turned into business conversations. After I completed my script, he read it and thought it was great. He wanted to make a few tweaks, but we both agreed that this was something we wanted to move forward with. What were some of the outside opinions of people when you guys decided to collaborate? Although Larry and I are from different worlds, there has always been a mutual respect between us. As people we need to remove the labels that define us. Look at Mike Tyson and Cus D’Amato. Without Tyson having D’Amato by his side, he wouldn’t have been a world champion. Their relationship had nothing to do with race, it was about experience and talent. Guidance should never have a color barrier. If you see someone in need of help, you have a moral responsibility to help them right? Some of the things I was going through, Larry was able to relate and connect with me on another level. Larry also has had people believe in him, and look out for him to help him move forward. Our relationship is much deeper than business. Being an African American filmmaker, is it possible to sell out? What does that mean to you? Selling out traditionally means that because I’m black, I can only make black films. The moment I make a film that crosses over, now I’ve sold out. That view point only exists in smaller cities that are still stuck on race. The main topic should always be on money, it has nothing to do with color. I will never forget where I’ve come from, I’m still here every day. Filmmaking literally saved my life. I could never “sell out,” because I’m comfortable with myself and where I’ve come from. Do you feel a duty to explore culture through your films? Absolutely. I have to show respect to the black film makers that came before me, but I don’t want the responsibility of only making black films. There shouldn’t be such a thing as a “black” film. That’s our problem in America today. There are too many titles; black, white, Hispanic, Republican, Democrat. It feels like the only time we will come together as people is when aliens attack us. Then it will be humans vs. aliens. If that ever happens, hopefully, we will all look at each other as human beings. I assume the business between you and Larry worked out because you guys formed a company together. Can you tell me more about that? 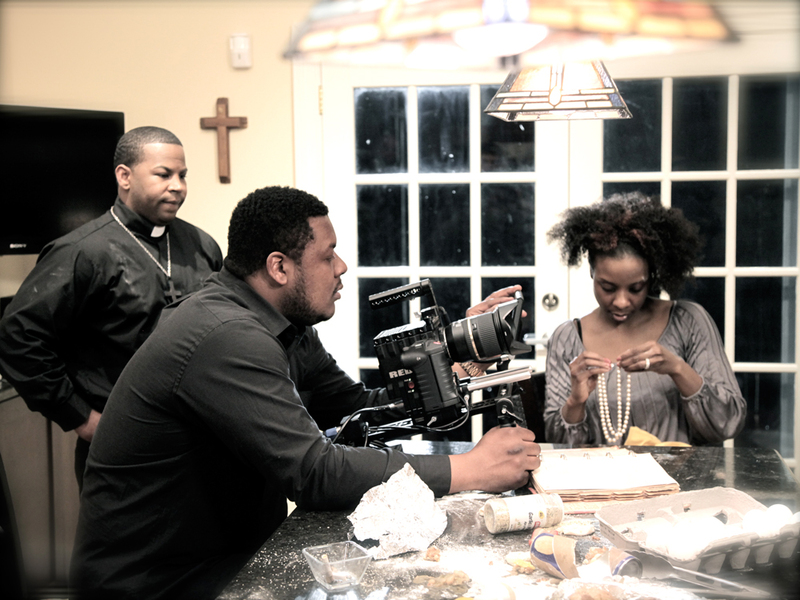 We formed Black Rose Films and we are discussing the production of another film. We have agents for The Romans and are actively seeking distribution. The film has won several film festivals and other awards, so we are looking to roll that momentum into the next project. We plan on making the next project even bigger.